Europeans must remain united ahead of the most crucial EU elections in history, high-ranking officials told top CEOs in a closed-door meeting held in Brussels last week, EURACTIV.com has learnt. On 27 November, BusinessEurope, Europe’s main business lobby group, held its annual meeting between chief executives representing the 20 largest companies in the EU and its Support Group, which includes 69 companies and senior European Commission officials. EURACTIV contacted both BusinessEurope and the EU executive to find out what was discussed at the meeting. Both acknowledged that the meeting had taken place. BusinessEurope said the objective was to have a platform of exchanges between the CEOs and leaders of the European Commission on topical matters for business. This year’s event was hosted by Commission Vice-President Jyrki Katainen and business leaders discussed topics such as the industrial policy to support growth and job creation and how to capture the megatrends of digitalisation and circular economy. “With Commissioner Pierre Moscovici, the CEOs discussed the EU’s economic situation and Economic and Monetary Union (EMU) and business taxation,” BusinessEurope said. The group also met Günther Oettinger to discuss the post-2020 Multiannual Financial Framework (MFF) and debated with Commissioner Cecilia Malmström the EU’s relations with the United States and China, as well as recent developments around the World Trade Organisation (WTO) and free trade agreements (FTAs). 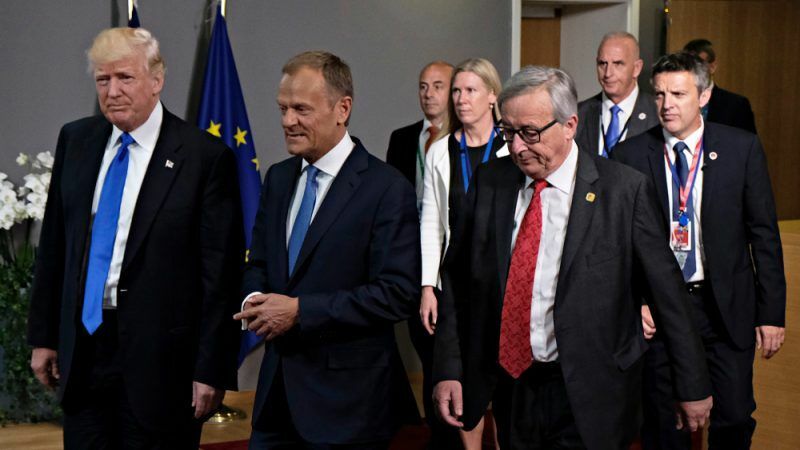 However, a source who spoke to EURACTIV on condition of anonymity said the Commissioners were paying special attention to the next EU elections in May, amid rising populism. Particularly, one Commissioner said: “These elections are the most crucial ones in the EU’s history […] more important than every national election”. Referring to the same topic, another Commissioner insisted that now is the time for pro-EU forces to remain united, according to the source. Malmström reportedly said Brussels was trying to improve its relations with Washington “but we don’t see the daylight”. “The Commission officials left a general feeling that the US does not want the EU united,” the same source said. In the meantime, US secretary of state Mike Pompeo held a speech in Brussels on Tuesday (4 December), saying that the Trump administration was building a new world order upheld by American leadership and democracy. He said the US did not “abandon” its friends in the international system and lashed out against Iran and China. China’s economic development did not lead to an embrace of democracy and regional stability; it led to more political repression and regional provocations. “China has routinely exploited loopholes in the World Trade Organisation rules, imposed market restrictions, forced technology transfers, and stolen intellectual property. And it knows that world opinion is powerless to stop its Orwellian human rights violations,” Pompeo said. On Iran, he said it didn’t join the community of nations after the nuclear deal was inked. “It spread its newfound riches to terrorists and to dictators,” he said, adding that Tehran holds multiple American hostages, and Bob Levinson has been missing there for 11 years. But the American official also criticised the EU partners, saying that they sometimes wrongfully perceive the US actions. “Even our European friends sometimes say we’re not acting in the free world’s interest. This is just plain wrong,” Pompeo emphasised. Here is the list of CEOs who attended the talks: Amit Bajaj, Chief Executive Europe of Tata Consultancy Services; Svein Richard Brandtzæg, President & Chief Executive Officer of Hydro, Youngsuk “Y.S.” Chi, Chairman of Elsevier; Carlo d’Asaro Biondo, President EMEA Partnerships of Google; Jo Deblaere, Chief Operating Officer and Chief Executive Europe of Accenture; Alain Dehaze, Chief Executive Officer of The Adecco Group; Bertrand Deroubaix, Senior advisor to the chairman & CEO of Total and Board member of Total Refining & Petrochemicals; Saori Dubourg, Member of the Board of Executive Directors of BASF; Philippe Ducom, President of ExxonMobil Europe; Susanne Fiedler, Senior Vice President and Managing Director of MSD Germany; Marcos França Chief Executive Officer of Lhoist Group; Pierre-Dimitri Gore-Coty, Vice President and Regional General Manager in EMEA of Uber; Ilkka HämäläPresident & Chief Executive Officer of Metsä Group; Paul Hudson Chief Executive Officer of Novartis Pharmaceuticals; J. Jon Imaz, Chief Executive Officer of Repsol; Georg Kapsch, President of the Federation of Austrian Industries; Miroslav Kiral’varga, President of the National Union of Employers of Slovakia (RUZ); Peter Mather Chairman of BP Europe; Evangelos Mytilineos, Chairman and CEO of Mytilineos; Matthias Rebellius, Chief Operating Officer of Siemens Building Technologies Division; Thomas Alexander Schmid, Chief Operating Officer of Hyundai; Tomas Mar Sigurdsson, Chief Operating Officer and Executive Vice-President of Alcoa; Michael Stassinopoulos, Executive member of the Board of Directors at Viohalco; Peter Stracar, President and CEO of GE Europe.